IVINS – Government officials and residents gathered by Ivins City Hall for a ribbon cutting and bus ride signifying the arrival of SunTran service to the city. “This is a big deal for a little city,” Ivins Mayor Chris Hart said. 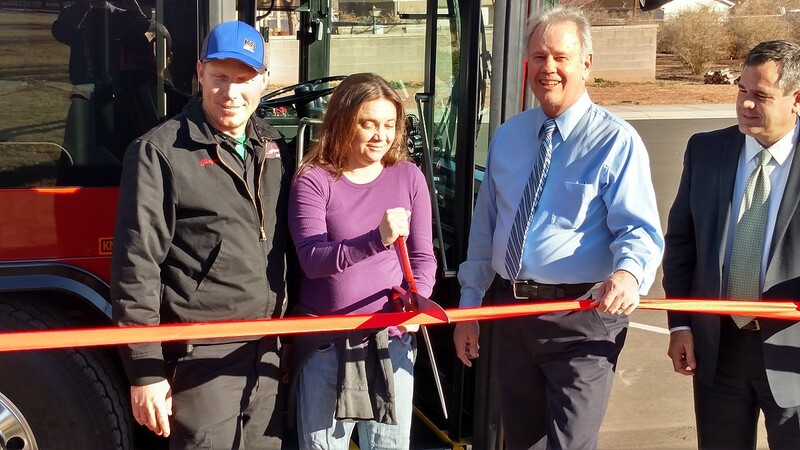 The people of Ivins will benefit from the introduction of the new SunTran route, he said, and gave credit to Ivins resident Traci McDonald for being one of the first to advocate for expanded service into Ivins. Traci McDonald, who is blind, said she approached the Ivins City Council about six years ago about bringing a public transit system in Ivins. At the time, she said, she was a kidney patient who was being treated in St. George. The bus would take her as far as the Sand Hollow Aquatic Center down Sunset Boulevard, but that was it. After doing some research she could take to the Ivins City Council, Traci McDonald said, she discovered that 16 percent of Washington County’s residents with disabilities or medical issues live in Ivins. A bus system would benefit them, she said. Others who will benefit from the new route include students going to Vista Elementary School and Tuacahn High School, Hart said. 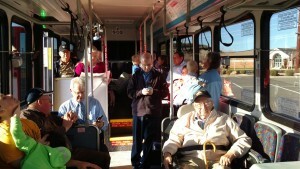 It will also provide transportation for people going to and from the Ivins Veterans Center. Shane McDonald, an Ivins city councilman and Traci McDonald’s brother-in-law, said getting an idea of how much bringing bus service into Ivins would cost wasn’t easy at first. However, they knew it wouldn’t be an inexpensive endeavor. “This bus alone is $400,000,” Shane McDonald said, as he and his family rode the SunTran bus Wednesday traveling the new Ivins route. “Not a cheap undertaking,” he said. However, once Ivins officials learned about federal grants that heavily subsidize public transit projects, the impossible suddenly became possible. 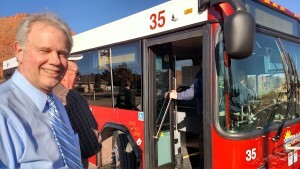 Talks between the City of St. George, which manages SunTran, and Ivins City about public transit expansion bore fruit in August 2013 when an interlocal agreement was signed between the two municipalities. Under the agreement, Ivins agreed to purchased a new bus for the route for approximately $370,000, plus put in an additional $122,000 for the first year of service. After the first year, the annual cost is estimated to run Ivins $27,000. Federal grants cover 80 percent of equipment costs and 50 percent of operations costs overall. “I’m so grateful you guys did this,” Traci McDonald said to Hart and other city officials persent. 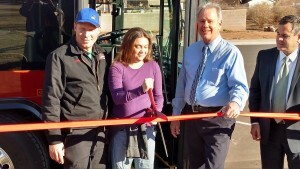 Together with Hart and Shane McDonald, she cut the ribbon in front of the new SunTran bus and people were invited inside to take a seat and see the new route first hand. “We think this is going to be the beginning of an ever-expanding transit service throughout the county,” Hart said. Also present at the ribbon cutting were representatives of the City of St. George and Five County Association of Governments. “I see the formation of a great system,” St. George Mayor Jon Pike said, also referring to the potential for a county-spanning public transit service in the future. SunTran service in Ivins officially starts Thursday between 5:40 a.m. and 6 a.m. with the final runs at 7-7:24 p.m., depending on the location along the route. Beginning the same day is another route in St. George that will go from Sunset Corner and connect to the Bloomington Wal-Mart by way of Dixie Drive. “We can get all the way to Wal-Mart now,” Shane McDonald joked. The SunTran Ivins route connects to the St. George routes at Sunset Corner, 1091 N. Bluff St. From there the route heads into Ivins by way of Santa Clara, then down 200 East in Ivins. After a few stops, it then heads down Snow Canyon Parkway and back toward Sunset Corner. Stops along the way include various points along 200 East, like the Lightfoot’s Chevron, Red Mountain Elementary and the Veterans Center. Other stops include Ivins City Hall, Vista Elementary School, and the Tuacahn Amphitheater complex. There are no stops in Santa Clara. Cost for a single ride is $1; a day pass is $2.50; and a monthly pass is $30. Rides for seniors ages 65 and above, as well as disabled individuals, are 50 cents. Additional information on the bus routes and ride costs can be found on the SunTran website. Washington City officials are also moving ahead with efforts to get SunTran into their city. Last week the Washington City Council passed a proposed interlocal agreement to be presented to St. George for their review and possible approval. Videocast by St. George News videographer Leanna Bergeron. why no stops in Santa Clara? Because they didn’t pay for the bus. Pay your share to get it. but the bus uses the streets in Santa Clara. And I do pay for it in ST G.
They are discriminating against us, LET’S SUE! i think its a great addition to st.george. Im so happy to live in Ivins and can save gas and $ to get to town. Way to go Ivins my hat is off to the Mayor and City counsel of both citys im sure this was a tough descision to get here. Now…..put in some darn bus stop benches!!! Why oh why does Washington County make everyone stand (most stops), sit on a curb (everywhere), balance on sharp rocks (valley view) blaze in the hot sun all summer while waiting for a ride???? In normal-larger cities bus benches are the norm. This town is slow going, get some benches for the people waiting!!! The only benches are by the college, don’t know why they got so lucky? Display for the parents in town? The college kids get to sit and wait while the rest of the county has seniors sitting on curbs?!? !